Please note that an Internet connection for program activation is necessary to use this DVD! The purpose of this DVD is to teach players how to conduct the attack on the black king using different methods. 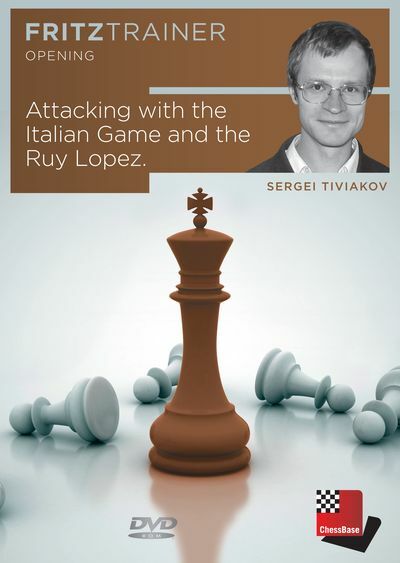 Although the Italian Game and the Ruy Lopez are mostly positional openings, it is very often possible to make use of attacking methods of play. This DVD is based mostly on the personal experience and games of the author, thus making it a unique chess product. The methods described in the DVD are the results of the life-long experience of the author who has played the Ruy Lopez and the Italian Game from his childhood and has scored with it many, many wins, including some against the world�s strongest players. The DVD is divided into 4 chapters according to those attacking methods which have given and still are giving the author the best results. Also several other games by other players (such as A. Karpov, for example) have been added and explained. To complement the instruction, a database is provided which contains all the games which the author has played in the Italian Game and the Ruy Lopez since 1986. A huge number of these games have never been published before. There is also on this DVD a comprehensive database of more than 1 million games played only in the Italian Game and the Ruy Lopez (this database has been compiled from different sources). Other databases of only annotated games and references have been added as well. Everything makes this DVD an excellent comprehensive product for learning how to play the Italian Game and the Ruy Lopez and achieving the best results with these openings! Minimum: Pentium III 1 GHz, 1 GB RAM, Windows Vista, XP (Service Pack 3), DirectX9 graphic card with 256 MB RAM, DVD-ROM drive, Windows Media Player 9 and internet connection for program activation. Recommended: PC Intel Core i7, 2.8 GHz, 4 GB RAM, Windows 7 or Windows 8, DirectX10 graphic card (or compatible) with 512 MB RAM or better, 100% DirectX10 compatible sound card, Windows Media Player 11, DVD-ROM drive and internet connection for program activation.